VBConversions has the most accurate VB.Net to C# Converter money can buy. The VBConversions VB.Net to C# Converter will convert your VB.Net program to C# with over 99% accuracy. It won the coveted Visual Studio Magazine Reader's Choice Award in 2006 in the developer tools category. It was chosen by real world developers in the field just like you. Free Download. The VB.Net to C# Converter even converts some of the most difficult features other programs don't even attempt, such as LINQ, embedded XML, parameterized properties, local shared variables, On Error Goto's, event handling, complex Case statements, API calls, and more Some converters reverse engineer assemblies, producing unreadable assembly like code in C#. VBConversions VB.Net to C# Converter is a source code to source code converter. Your code maintains its original readability and flavor (including line and inline comments), Reliability is very good, over 99% accuracy in most tests. Don't take our word for it. Download the Free Version Today at www.vbconversions.net and check it out for yourself. Changes: 01/12/2019 - VB.Net to C# Converter 5.06 Released! Includes many improvements! 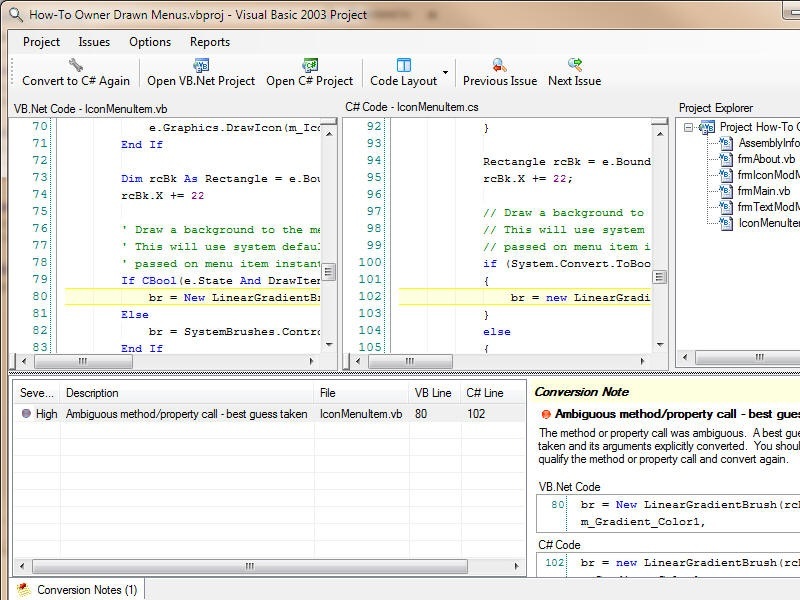 Press release: VBConversions Releases VB.Net to C# Converter 5.06! VBConversions Releases VB.Net to C# Converter 5.06 with major enhancements! The setup.exe file may be distributed freely, as long as no money is charged for it and it is not modified in any way. END USER LICENSE AGREEMENT FOR VBCONVERSIONS SOFTWARE. IMPORTANT-READ CAREFULLY: This VBConversions End-User License Agreement ("EULA") is a legal agreement between you (either an individual person or a single legal entity, who will be referred to in this EULA as "You") and for the VBConversions software product that accompanies this EULA, including any associated media, printed materials and electronic documentation (the "Software Product").